This webpage was mostly written very shortly after the flood in 2006, and still reflects that time. In New England the winter of 2005-2006 was drier than usual, so in May of 2006 we were already watching the very low river flow and worrying about possible summer droughts. But then it rained ...and rained ...and rained ...and rained. Soon the Ipswich River devoured parts of downtown Ipswich, separated people from their homes, damaged bridges, and snarled traffic. Preventing recurrences of flooding damage has become important in the Town of Ipswich. Dismissing this as a "hundred year flood" --a rare but not unexpected event-- compares apples to oranges. The Ipswich River watershed a hundred years ago (apples) was very different than it is now (oranges). This flood is by far the highest on record (although the stream gage measures floods only with middling accuracy if they're outside the fully calibrated range), and the last three floods have each been worse than the one before. The sense of continuity with old records of a river with the same name is a bit illusory. This latest flood is the highest ever by several feet, the previous flood used to be the highest in memory, and the flood before that was a record at the time too. For at least the last fifteen years, each flood has seemed worse than the one before. A government agency advised a local business owner --apparently based on historical data-- that his business was safe ...but then all three recent floods innundated that location. Recorded history has nothing comparable, and the watershed's soil and rock composition and the river's channel haven't changed. What has changed is a lot more rain goes directly into the river as surface runoff instead of soaking in to the ground. Rain runs down roofs, across parking lots, and in street gutters to the nearest drain, which all too often dumps it directly into the river. Previously, vegetation slowed runoff and allowed water to seep into the ground. Now the area of impervious surfaces has increased and more rain makes its way directly to the river. We were warned flooding would become more prevalent and more severe. And it has. When full summer hits we'll wish we had that water. But it went by too fast and too forcefully to capture. What a waste. We shouldn't have tried so hard to get rid of it so quickly. Instead we should have tried to save it --either in the ground or in cisterns or barrels-- to have later. To learn more about the Ipswich River, see the Ipswich River Watershed Association (IRWA). To learn more about flooding damage, see Preventing Ipswich Flooding. To learn more about the Town of Ipswich, see a Thumbnail Description of Ipswich. Saturday May 13 the rain seemed reasonable although it made everything soggy. The river rose from its very low level to about where it should be in spring. But through the rain Sunday May 14 the situation on the ground was alarming. There were ponds everywhere in places that used to be yards and pastures, and water flowed across several nearby roads. The governor declared a state of emergency, parts of the neighboring town of Peabody were evacuated, and getting around the many road closures was difficult. Although the rain slacked off Monday May 15, the Ipswich River continued to rise higher than it's ever been, far past a "flood". The town of Ipswich is far enough from the Merrimack River it was insulated from that flooding, but it was gobbled up by its own Ipswich River. Tuesday May 16 the Ipswich River rose even higher although the rain had pretty much stopped. Although Wednesday May 17 was partly clear, the Ipswich River fell only a little bit back to Monday's level, and almost all the places that had been wet remained flooded. 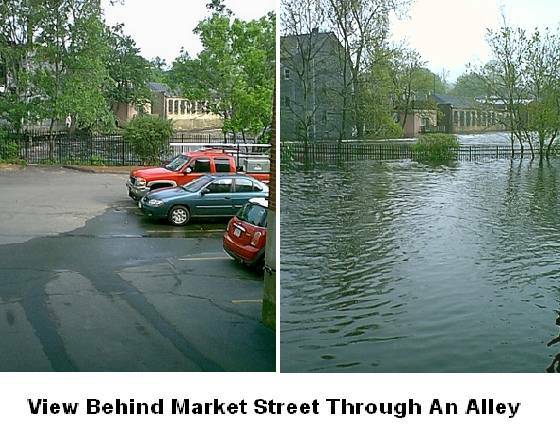 Thursday May 18 the river fell enough that businesses on South Main Street began cleaning up and drying out in earnest and the Choate bridge was reopened to both pedestrian and vehicular traffic. But the river had by no means returned to its channel and the businesses on the southeast side of Market Street were still innundated. In fact, even though the water level had fallen significantly it was still higher than the previous flood. Ipswich is the last of the 22 towns in the Ipswich watershed and carries the Ipswich River into the ocean. So the river is largest in Ipswich, and Ipswich suffers the brunt of what all the upstream towns do. The last section of the Ipswich River is tidal. Tidal effects extend quite far upstream, right into downtown Ipswich. Just above the edge of tidal effects, there's a dam across the river that powered the Ipswich Hosiery Mill about 80 years ago. Downtown Ipswich has three vehicle bridges across the Ipswich River. When roads leading to the almost 250 year old Choate bridge went under water Monday May 15, that bridge was closed to vehicular traffic. The flooded river overtopped the County Street bridge in the middle of the day Tuesday May 16, so that bridge too was closed to traffic. At the same time the Choate bridge was further closed even to pedestrians. During this time all traffic had to use the inconvenient Green Street bridge. The County Street bridge was reopened on Wednesday May 16, but roads leading to the Choate bridge remained flooded and the Choate bridge remained closed another day. The Choate and County Street bridges were re-closed on Friday June 2 after a more thorough inspection by the state with divers. The divers found evidence of significant damage to the footings of both bridges due to scour and riverbed changes by the floodwaters. Both bridges will remain firmly closed for the foreseeable future. Since Ipswich vehicle traffic was reduced from four (or five if you count the Willowdale) bridges to only one, and since two state highways (1A and 133) must cross one of them, Ipswich is working with the state to do something soon rather than just living with the existing situation until at least the end of summer 2006. One possibility for quick action was "temporary bridges" constructed by the state using deep sturdy piers on each end and big strong metal beams reaching from one pier clear across the river to the other. They would have been installed over some of the damaged bridges. Temporary bridges were possibilities for Warner's (Mill Road) bridge and County Street bridge. They were much less likely for the Choate bridge crossing both because the existing approach roadway turns very near the bridge and because the bridge is so strongly arched or humped up there's no clearance for the beams of a usable temporary vehicle structure. June 7 a significant work crew coordinated by Mass Highways began dealing with the Choate bridge. They initially expected their work to take only a week or two. Depending on what they find and are able to do, the Choate bridge may reopen when they're done ...much sooner than originally expected. The question of who will pay for the work won't be fully sorted out for a while. Even though two state highways use the Choate bridge, it's wholly owned by the Town of Ipswich. Very heavy rains on June 7 (well over 2 inches in 24 hours!) raised the river significantly again and interfered with the repair work, which was suspended over the following weekend. The crew finished up repair work on the south side of the Choate bridge June 28, and closely inspected the north side and found no further problems, so the bridge was reopened early the next morning. Route 1A (and Route 133) traffic was flowing across the bridge normally midday June 29. Although the bridge is structurally sound again, it's not exactly "like it was". The bridge has changed shape subtly; there are now curves and gaps that weren't there before the flood. When they finished with our Choate bridge the same work crew moved over to tend to our County Street bridge. The condition of that bridge was a little dubious even before the flood. The flood reshaped the stream bed significantly; for example a very large sandbar appeared in Turkey Cove. The work crew finished prompt repairs to the County Street bridge the week of July 24. They returned their attention to the Choate bridge, where they're nearly invisible, shielded from view by the parapet and some trees and having to close the bridge only a couple times and then only at night. Prompt repairs had fixed the structure itself, but left blocks and voids in the wrong places making it difficult for water to flow through the channel. Also after the County Street bridge prompt repairs were completed, a work crew stabilized the Warner's (Mill Road) bridge so it wouldn't collapse completely (which had been a real fear). But it remained closed to cars, pedestrians, and even boaters going under it. (Fortunately Warner's bridge is over a section of the Ipswich River bracketed by the Willowdale dam upstream and the Sylvania[EBSCO] dam downstream, so it's little used by boaters.) Fully repairing Warner's bridge required first having repair plans pass muster with Mass Highways, then the towns of Ipswich and Hamilton jointly performing the work. The plan was that the towns of Ipswich and Hamilton would be reimbursed by FEMA after the work was completed. Warner's bridge finally reopened in March 2009. Most people driving across it never realize that Warner's bridge is very picturesque because there's no way to view it from the side on dry land without entering private property. Warner's bridge was tougher to fix than the Choate or the County Street bridges because the substructure (not the walkways above the surface) was originally dry-laid --constructed without any mortar. (Another difficulty: the original foundations had deteriorated and disappeared over the years.) Gravity and well-balanced forces held the whole thing together for almost two centuries. But when the footings shifted (as in the flood), the bridge could have easily disassembled itself into just a large chaotic pile of loose stones in the riverbed. Part of the repair was to tie the bridge stones together with long metal tension rods (which were installed so they're nearly invisible), so there's no longer any possibility of the bridge disassembling itself.